1. 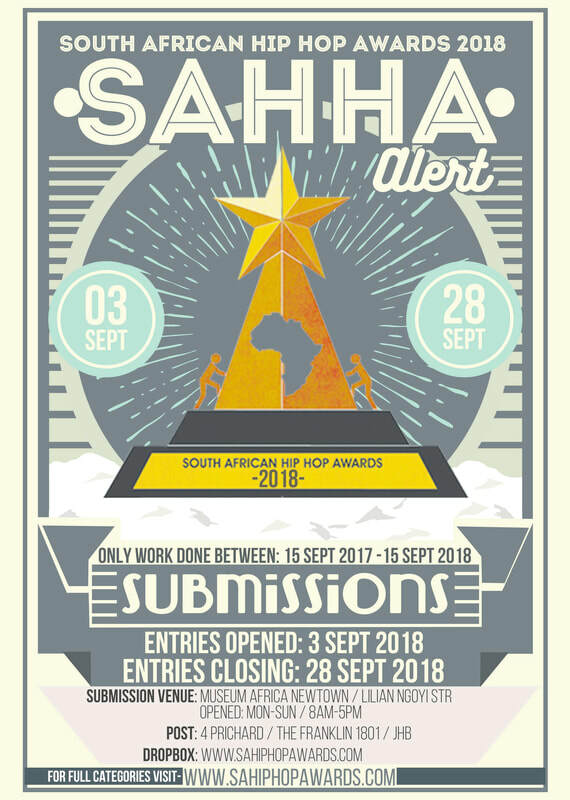 Download Sahha Submission forms. 4.Drop your Work/material in our Submission Tab in our Website or Manually at Museum Africa in Newtown. The nominated art form must be released or occur in South Africa. Any SA Hip Hop album/mixtape/video/event/song/that was released or impactful or effective during 15th September 2017 to 15th September 2018. The artist/group must be South African, if not then they must have a South African work permit and their work must be produced and released in the Republic of South Africa. Outlet Submissions: Only 1x correctly labelled envelope with hard copies of material will be accepted per entry. Include 2x CDs, artist profiles and press releases. Dropbox Submissions: Only 1x correctly labellef ZIP file will be accepted per entry. Upload digital copies of material, artist profiles and press releases. Courier Services: Only 1x correctly labelled envelope with hard copies of material will be accepted per entry. Include 2x CDs, artist profiles and press releases. you went through the details to follow the Procedures. ​forms in a zip file supported with your body of work. submit again after 24 hours.